I've harmed nobody, just robbed a few graves! The film starts with Baron Victor Frankenstein, in prison awaiting execution for murder, where he tells the story of his life to a priest. After succeeding to his father's estate at a young age, he is mentored by Paul Krempe. As Victor Frankenstein grows up, the two become great friends, and they eventually collaborate on the Baron's scientific experiments. One night, they successfully bring a dead dog back to life. Frankenstein suggests that now they must create life from scratch, but Krempe withdraws when Frankenstein suggests using human body-parts. Victor Frankenstein does eventually succeed in bringing a body he made to life utilising a corpse found swinging on a gallows, hands and eyes purchased from charnel house workers and the brain of a distinguished professor. Frankenstein invites the professor to visit in order to murder him by pushing him off the top of a straircase, making his death appear accidental, before having him buried in the Frankenstein family vault. Unfortunately, the creature Frankenstein creates does not have the professor's intelligence and is both violent and psychotic due to its brain having been damaged before being implanted. The creature is locked up but escapes, is shot by Krempe and buried in the woods. 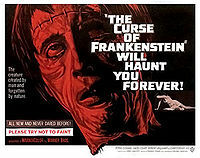 Frankenstein later revives the creature and uses it to murder his maid, Justine, who he refuses to marry even though he has made her pregnant, when she threatens to tell the authorities about his strange experiments. The creature escapes again and threatens Frankenstein's bride to be, Elizabeth. It is shot and falls into a bath of acid. Its body is completely dissolved, leaving no proof that it ever existed. Frankenstein is imprisoned for the death of Justine. He implores the returning Krempe to testify to the priest and his gaolers that it was the creature that killed Justine, but Krempe refuses and Victor Frankenstein is led away to be executed for his crime.